Important Instructions For Filling UPSC Civil Services Pre Online Application 2015 | IAS EXAM PORTAL - India's Largest Community for UPSC Exam Aspirants. Applicants are requested to note that before filling the online application they may have a careful look on the common reasons where an applicant’s online application is being rejected by the Commission. Applicants are therefore advised to be careful enough so that chances of their applications being rejected are minimized to the best possible extent and their effort is not lost due to the reasons which can be avoided by them if they remain slightly more careful while submitting their application to the Commission. The Experience of Commission (UPSC) shows that major rejection happens due to the following reasons. (a) Application being rejected on the grounds of bad quality of submitted photograph. (b) Application being rejected on the grounds of bad quality of submitted signature. (c) Application being rejected on the grounds of swapping of photograph with that of signature. (d) Only PART-I of the application submitted to the Commission and thus their application is incomplete because of non-submission of PART-II. (e) Applicant submitted multiple applications, however fee deposited (TID**) against a particular application (RID*) is mentioned for other application having different RID. 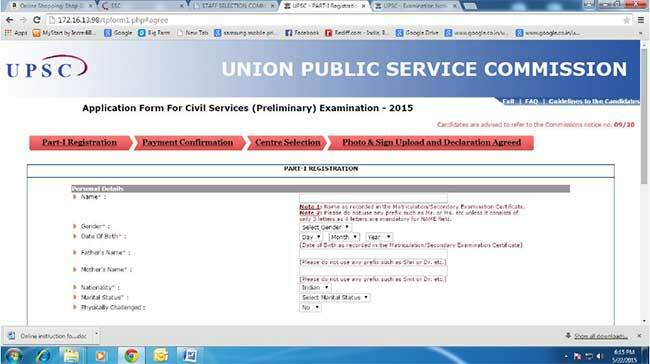 (f) Applicant having submitted PART-I, but failing to complete PART-2 registration. Applicant must complete PART-2 registration by uploading appropriate photograph and signature, paying admissible fee and giving his choice of examination centre for CS(P), etc. (g) Application being rejected on the grounds of non submission of payment proof to the Commission within specified time in case of fictitious payment ***cases (which are intimated to the applicant through e-mail as well as published on the website of the Commission within 2 weeks after the last date of receipt of online application). * TID is Transaction ID, which is given by Bank official when the applications deposit his/her fee through “Cash” mode. TID is automatically generated when “Internet Banking” or “credit/debit card “mode is used for making the fee payment. ** RID is Registration ID, which is generated by the system when the application completes PART-I registration of his/her application. ***Fictitious payment cases are those cases for which the Commission does not receive any information from the bank authorities to which the applicant has claimed to have deposited his/her fees. 1. Applicants are advised to carefully go through the detailed Notice of Civil Services Examination, 2015 – No. 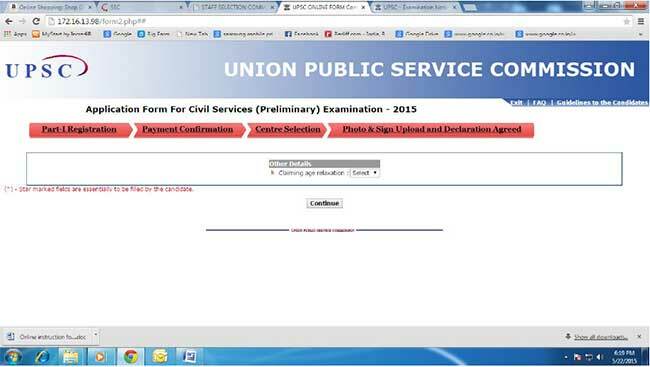 09/2015-CSP and 10/2015-IFoS, which can be viewed on the website of the Commission (www.upsc.gov.in) in Examination submenu. 5. Click on the Part 1 registration given against Notice No. 09/2015-CSP. This will lead you to the Part 1 Registration Form. The Part-I Registration is done in 2 steps in which the applicants have to fill in the requisite information, particulars and details asked for. 6.1 Name: As recorded in the Matriculation/Secondary Examination Certificate. Applicants are not to use any prefix such as Mr. or Ms. etc unless their name consists of only 3 letters, as 4 letters are mandatory for NAME field. 6.2 Gender: To select from Male/Female. 6.4 Father’s Name: Applicant should not use any prefix such as Shri or Dr. etc. 6.5 Mother’s Name: Applicant should not use any prefix such as Shri or Dr. etc. ? 6.6 Nationality: Should opt from Indian/Others. Applicant should note that only Indian citizens are eligible for Indian Administrative Service/Indian Police Service. 6.7 Marital Status: Applicant should choose from Unmarried /Married /Widow/ Widower/ Divorcee. 6.8 Physically Challenged: Applicant should indicate by ‘Yes/ No’. 6.9 PH Category: There are three categories i.e Ortho, Blind/Low Vision, and Deaf-Mute. Applicants with less than 40% disability will be considered as NON-PH and they are not eligible for claiming age relaxation under the Rules. For other details, applicant may refer to the Detailed Notice of this Examination. 6.10 Physically challenged certificate date: Date of issue of the Certificate is mandatory. 6.11 Community: Applicant should fill the appropriate category from General/ OBC/ SC/ ST. Applicants who belongs to OBCs but come under the 'Creamy Layer’ is not entitled to OBC reservation as per Rules. Such type of applicants will be treated as belonging to General category. 6.12 If you belong to Minority: In case of yes, should choose appropriate ‘Minority’ option. 6.13 Fee Remission Claimed: Admissible only to SC/ST, PH and Female candidates. 6.14 Educational Qualification: Applicant should fill the appropriate information. 6.15 Address: Applicant should fill the correct address for communication, including his/ her mobile number and e-mail address. 8. Here the system asks if the candidate wishes to apply for ‘Age Relaxation’. The candidate will be given the option to select the category under which he/she is applying for age relaxation. (Candidates are advised to refer to the detailed Notice No. 09/2015-CSP which is available in the website www.upsconline.nic.in). 11. Have you appeared at CSP 2011: Have you appeared at CSP, 2011 but are otherwise ineligible for Civil Services Examination, 2015 either due to completion of the number of attempts available for CSE, 2015 or due to attainment of upper age limit on the crucial date for Examination as per CSE, 2015 Rules? The candidates must ensure that they had appeared at CSP, 2011 before applying for CSE, 2015 if they are otherwise ineligible either in terms of age limit or in number of attempts. Any false statement in this regard may invite an action under the Rule 14 of the CSE, Rules, 2015 by the Commission. 12. No. of Attempts already made in Civil Services Examination: Must be filled correctly. 13.2 Optional Subject for Paper VI & VII: To be selected from the given list in dropdown menu. 13.3 Language Medium for Examination for Paper I to Paper VII: To be selected from the dropdown menu carefully. 13. Specific Details for Indian Forest Service’s Examination: viz, Centre for IFoS (Main) Examination from the list of 10 centres. First Optional Subject and Second Optional Subject: Applicants must fill these fields carefully since no request for change in this information at any later stage (i.e DAF) will be considered. 13.1 Centre for IFoS (Main) Examination: To be selected from the given list of 10 centres in dropdown menu. 13.2 First Optional Subject: To be selected from the given list in dropdown menu. 13.3 Second Optional Subject: To be selected from the given list in dropdown menu. List of other optional subjects comprise only those subjects which are permissible along with the first optional subject already chosen as per the rules of notification. 13.4 Attempts already made in IFoS Examination: To be filled correctly. 14. Click on “Continue” button at bottom of the page to proceed to the next step. Here the system displays all the information provided by the candidate in the application form for verification. ‘Update’ button is also provided therein at the bottom of the Online Application details to move back and make any correction in the information filled in. The candidates are advised to check the filled in details and satisfy themselves that all information are correctly filled. No change/ edit request of any information filled by the applicants on the submitted application would be allowed at any subsequent stage of the examination process. However, application may be submitted by the applicant to correct its earlier mistake with requisite fee in case not a fee exempted candidate. 18. 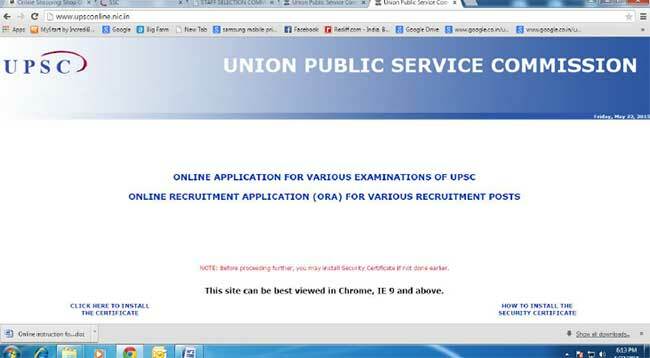 Once PART-I of the Online Application procedure is completed, an applicant has to complete the PART-II Registration for the successful Online Application Submission by clicking on the link ‘click here’ under Part-II Registration on the website (www.upsconline.com). 20. APPLICANTS OPTING TO DEPOSIT FEE IN CASH ARE ADVISED TO TAKE PRINT OF PAY-IN SLIP BY USING THE OPTION “Print Bank Pay-in-Slip”. Using this pay-in slip, they should deposit the fee in cash at any branch of STATE BANK OF INDIA. The Bank will not accept any other pay-in slip or challan than the one printed through the “Print Bank Pay-in-Slip” OPTION of this Online Application. After receipt of cash, the Bank would stamp the pay-in-slip and also provide a “TRANSACTION ID” as indicated on the Challan Form as SBI Journal Number. 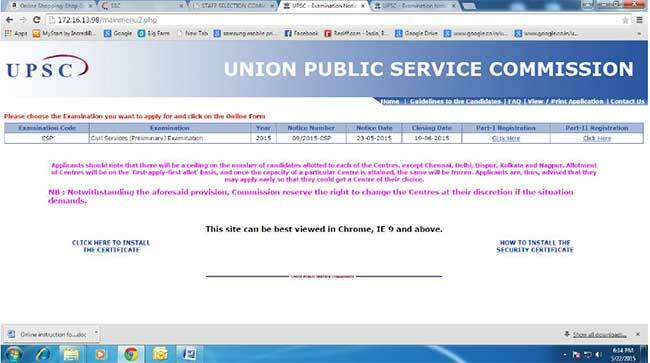 After paying fee through Cash Mode, The candidate would have to go to the website (www.upsconline.nic.in) again and fill the transaction id and other details with PART-II Registration process. 24. After uploading a fresh page shows the preview of the uploaded images by the candidate. Here the candidate is advised to see his/her uploaded photograph that the photograph is clearly visible/identifiable in the upper row and the specimen signature in the lower row. In no case these rows should be swapped and uploaded photograph and specimen signature must be clearly identifiable / visible, otherwise the candidature of the candidate is liable to be cancelled by the commission and no representation from the candidate will be entertained by the commission regarding any change for the wrong data uploaded /filled up by the candidate. If the candidate is satisfied with the uploaded images he may CONFIRM the uploading of photograph and signature by clicking on Confirm Upload button. If by any reason uploaded images are not up to the mark then the candidate can RELOAD these images by clicking on the Reload Photograph and/or Reload Signature button. They can view reloaded Photograph/signature by clicking on “Image refresh” button. The software will not save photograph and signature of the candidate unless he confirms the upload by clicking on Confirm Upload button. 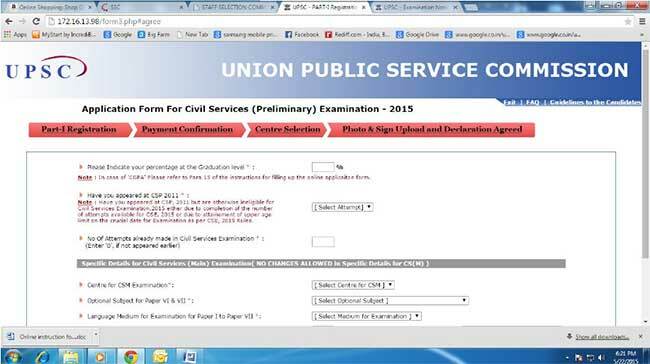 The candidates must ensure that they have completed the Online Application for CSP, 2015 (including filling up of Part-I and Part-II of the Form) before 11:59 P.M of 19th June, 2015 after which the web-link will be disabled.